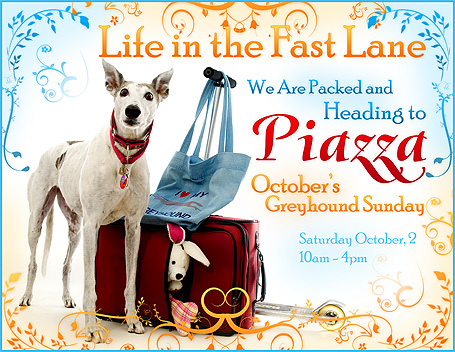 Greyhound Sunday: We are Packed And Going to Piazza! 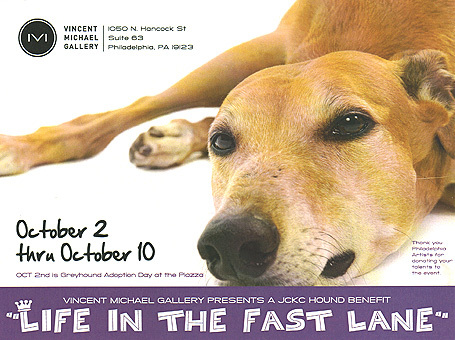 Bring your greyhounds and join NGAP and other area greyhound rescue groups to raise awareness and funds to assist Pam Davis in her efforts to re-home greyhounds from the JCKC track in Florida. 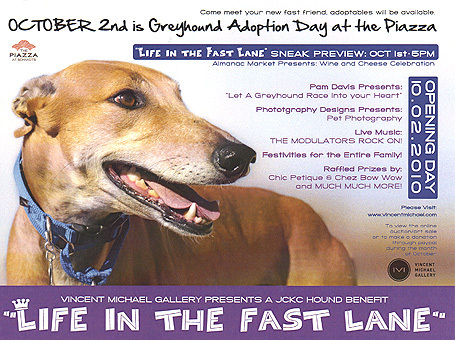 The greyhound rescue groups will take up about 12 courtyard vendor spaces at the Piazza. The Piazza is an 80,000 square foot Italian-style courtyard surrounded by artist studios, boutiques, restaurants, offices and apartments. The courtyard is open on Saturdays and Sundays to dozens of vendors and numerous events. On Saturday their 26 x 16 foot outdoor screen will show, throughout the day, greyhound photos submitted by the rescue groups. Bring your hounds and your tote bags and enjoy a wonderful afternoon strolling in the courtyard showing off greyhounds!!! Pick up one of our new calendars, browse the market vendors and shop the local farmers market on 2nd and Hancock. The Piazza is located at 2nd and Germantown Avenue off Girard Avenue in Northern Liberties (19123). Free parking lot on Hancock Street. For more info visit www.atthepiazza.com.